Welcome back from the long Thanksgiving weekend! Did you get filled up? Did you watch the parade and football? Did you shop on black friday? Did you make a fool of yourself in front of extended family? I answered "yes" to all of the above! So we made the drive from Indiana to Alabama on Wednesday morning and stayed through Friday evening. We spent Thursday with waaaay too many cooks in the kitchen. 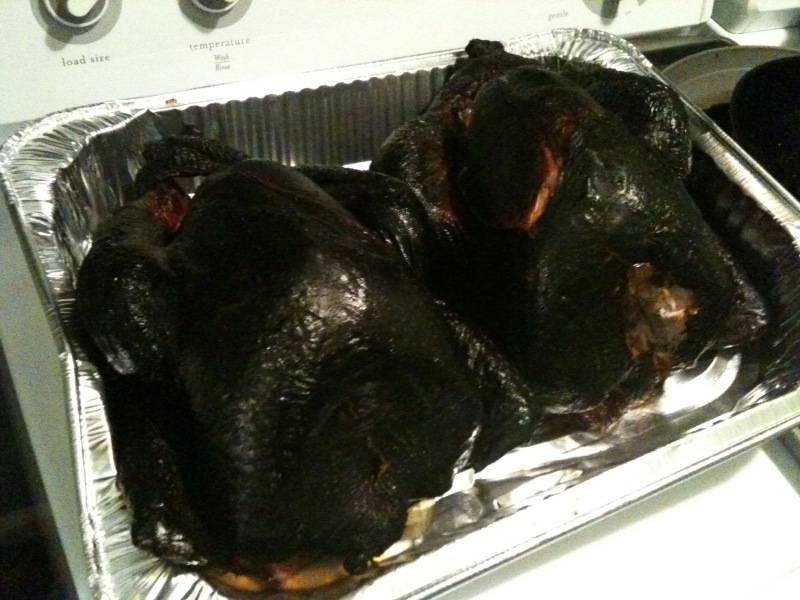 Hubby & BIL smoked the turkeys and the ladies all did the rest. So this resulted in black turkey, runny green bean cassarole and over-garlic-ed mashed potatoes. So then Black Friday rolled around. Now, I'm not one to get up at 2 am and elbow people, but I do like a good deal. So at about 7 we drove to the Huntsville Target to see what was left. So we got there, and I was able to pick up a few things on sale to cross that last few people off my list (yeah! I'm done!). (HERE COMES THE FOOL PART!) As we are strolling through the boys' clothing section looking at pj's. I proceed to hit a pole with my cart. This pole has a fire extinguisher strapped to it. I must mention that I am deathly afraid of these things. Growing up, my father had them all over the house. They were big and heavy and he always told me to stay away from them because they could explode. Well, I'm trying to get around this pole with my cart and to top strap breaks and the F.E. is just kind of dangling there. As I reach for it, the other one breaks and there it goes! It crashes on the floor, explodes and starts spewing the white chemical everywhere. 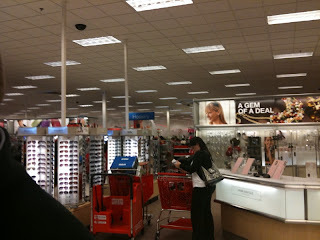 There just happen to be 3 Target workers standing there that are on their walkies in a flash "We have an emergency!" Hubby and I are tripping all over each other trying to get away from the still spewing FE. He grabs up the cart and pulls it along behind us (we did just work really hard to find all that stuff!). He asks me if I really wanted those PJ's for our son. "Um, yes" I say meekly. He pulls his shirt over his nose and runs back for them. At this point, the entire back half of the store is filled with white dust clouds. I can't see him. Will he be able to breath? Will security grab him up? Will he get the pj's? He emerges and we high-tail it to the checkout while the workers are still dristracted. We pay for all of our items. While laughing at ourselves, we hear people all around us talking about it. We can still see the white clouds from the checkout just gettting thicker and thicker. I snap a quick pic with my iphone and we are outta there! I am so glad that I don't live there and I only embarrassed myself in front of my in-laws. Have you every totally made a fool of yourself at a holiday function? Please share and make a comment! Sooo funny and embarrassing. I don't remember if I've made a fool of myself or not. I wouldn't care if I did. Congrats on being done with your x-mas shopping!